New Agco Air Drill works with 9900 series Air Carts. The Sunflower 9800 series Single-Disc Air Drill introduced by Agco at its August new products launch was developed in Australia with an eye to simplicity, ease of operation, and speed. It can adapt to various soils from no-till with heavy residue to soft, fluffy conventional tillage. Sunflower 9800 series machines are available in 30-40- and 50-foot widths. Innovative features include the ability to make down-pressure adjustments from the cab, two 25-hour grease zerks on each transport tandem for ease of maintenance and single disc openers for consistent, unobstructed seedbed. 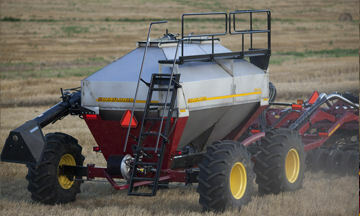 SPEED DRILL: The Sunflower 9800 series is designed to run at higher field speeds. Every opening is on a single row, allowing speeds of up to 13 mph with no loss of seeding efficiency. Drills are designed for use with Sunflower 9900 Series Air Carts, which offer three models from 280 to 525-bushel capacity.